Jim King spent five years in the Cardinals organization, learning from the likes of George Kissell and Johnny Keane, but he twice departed and never got much of a chance to make an impact with St. Louis at the big-league level. King, an outfielder who started in the first big-league game played in California, spent 11 seasons in the majors, primarily with the Senators. After making his professional debut at 17 in 1950 with the independent Vernon Dusters of the Class D Longhorn League, King was signed by the Cardinals. He played in the St. Louis minor-league system from 1951-54, including two stints with Omaha clubs managed by Kissell, the franchise’s iconic instructor. In 1954, King had his best season in the Cardinals organization, hitting .314 with 31 doubles and 25 home runs for Omaha. King, who had a strong arm, also contributed 19 outfield assists. King caught the attention of Wid Matthews, director of personnel for the Cubs, and on Nov. 22, 1954, the Cubs claimed King from the Cardinals in the minor-league draft. King made his major-league debut with the Cubs in 1955 and played for them for two seasons. In 1957, Cubs general manager John Holland was seeking to overhaul the roster. Cardinals general manager Frank Lane was seeking a left-handed pull hitter who could benefit from the Busch Stadium dimensions. The distance along the right field line from home plate to the outfield at the former Sportsman’s Park was an enticing 310 feet. Holland made a special trip to Memphis to talk with Lane as the Cardinals headed north from spring training. Their talks continued in the Busch Stadium press box lounge when the Cubs and Cardinals played in St. Louis during the first week of the 1957 regular season, The Sporting News reported. On April 20, 1957, the Cardinals reacquired King from the Cubs for outfielder Bobby Del Greco and pitcher Ed Mayer. “The deal for King was completed within 48 hours, culminating a lengthy series of conversations between Lane and Holland,” St. Louis writer Bob Broeg reported. Broeg described King as “a pull hitter for whom the Busch Stadium dimensions are tailored” and declared the Cardinals were “stronger and deeper” with King on the roster. The Cardinals issued uniform No. 9 to King. It was the number worn by Cardinals standout Enos Slaughter before it was retired by the club. King was used primarily as a pinch-hitter. 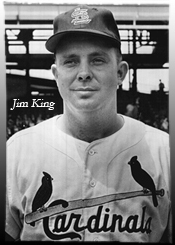 On May 15, 1957, less than a month after he was acquired, the Cardinals sent King to Class AAA Omaha in order to get their roster to the mandated 25-player limit. At Omaha, King played for manager Johnny Keane (who, seven years later, would lead the Cardinals to a World Series title) and hit 20 home runs in 116 games before being called back to the Cardinals in September. In 22 games overall for the 1957 Cardinals, King hit .314. All 11 of his hits were singles. King appeared poised to earn a spot on the 1958 Cardinals. However, the Cardinals were seeking catching help and the Giants needed a lefthanded-hitting outfielder to replace Don Mueller. On April 2, 1958, the Cardinals traded King to the Giants for catcher Ray Katt. In a big-league career spanning 1955 to 1967 with the Cubs, Cardinals, Giants, Senators, White Sox and Indians, King hit .240 with 117 home runs.